Natixis Japan Securities brings Natixis’ Corporate & Investment Banking expertise to clients in Japan, and serves as a gateway between the Japanese and global financial markets. We assist companies, institutional investors, insurers, banks and public-sector organizations in Japan, leveraging Natixis’ broad international expertise, the strength of Groupe BPCE, and our deep local knowledge. We provide tailor-made structured products to meet our clients’ unique risk-return requirements. Products can be based on a diverse range of underlying assets, including equity, foreign exchange and credit, as well as infrastructure project assets originated by Natixis’ global structured asset finance franchise. We offer euro and dollar sovereign and corporate paper, and facilitate debt placements in Tokyo by European corporate borrowers in a range of currencies. We manage regular issuances by Groupe BPCE and Natixis, including samurai, uridashi and private placements, supporting BPCE in becoming one of the largest samurai issuers in recent years. We provide financing and yield enhancement solutions using a range of derivative products, with a focus on Japanese, Asian, European as well as US stocks. We accompany our Japanese clients in their international projects, delivering tailor-made advisory, arranging, underwriting and servicing across energy & commodities, aviation, export and infrastructure. At Natixis Japan Securities, we are always on the lookout for talented people with the skills and outlook to contribute to Natixis’ growth in Japan. Should you have interest in joining our team, please send your resume and an overview of your objectives and position. Natixis Japan Securities (NJS) is a 100% subsidiary of Natixis S.A., the international corporate, investment, insurance and financial services arm of Groupe BPCE, the second-largest banking group in France. Natixis has a long-term commitment to Japan, founded on an operating history of over 20 years in the country, and enshrined in the bank’s strategic plan that prioritizes development in Japan as part of an ongoing internationalization of Natixis’ business. Our culturally-diverse team has a dynamic, international outlook and a profound respect for Japan. We are a proud participant in charity events and supporter of cultural initiatives, and are committed to bringing the benefits of Natixis’ expertise to our valued clients in Japan. 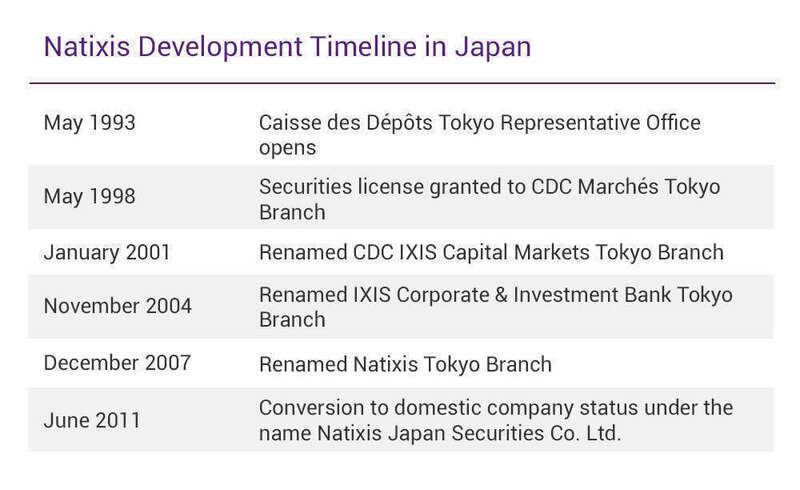 Natixis Japan Securities Co., Ltd.